A couple of weeks ago, I travelled to London to attend TADTalk 2018. TAD - Talking about Diabetes is in its third year and brings together individuals who have inspirational stories to share in the context of living with diabetes. The striking thing about the TAD events are they are completely about people living with diabetes and bringing them together. Warning - I totally sat in the wrong spot for nice photos. So they are woeful! Prime Minister, Theresa May - no she wasn’t there but JDRF UK organised to record a message to us that was played. She quoted Sir Steve Redgrave: "Diabetes will have to learn to live with me." I can’t think what the Irish equivalent of this would be??? Jen is a broadcast journalist who now works in online and social media for BBC Radio. Jen has been writing her blog: Miss Jen Grieves for almost ten years and has been known to Vlog also. Lydia was diagnosed at age 9 and is a JDRF UK ambassador, blogger at The Backpacker and the Pod, speaker and Diabetes UK camp volunteer. She was also celebrating because a couple of days earlier she handed in her final dissertation. Wahoo!!! Lydia told us her diagnosis story and all the amazing things that living with type 1 diabetes has brought into her life: she’s been a guest at No. 10 Downing Street, met the Duchess of Cambridge. She talked about her acceptance of type 1 diabetes as a teenager and how volunteering with JDRF made her realise: “Looking to cure diabetes was a dream. Learning to manage it every day was the reality”. Pete Davies was diagnosed with type 1 diabetes as a baby in 1954. He took us through his journey of diabetes treatment and management and told us how lucky he was to have a mother who worked in healthcare and both parents believed he shouldn’t miss out on anything because of his diabetes. 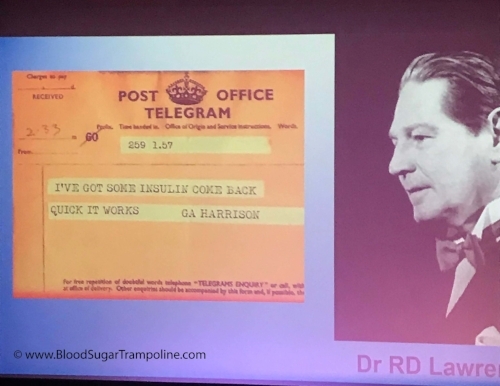 Pete was an inspirational speaker and entertained us with multiple anecdotes including the fact that he was treated by Dr RH Lawrence, who developed one of the earliest and largest diabetic clinics in the UK. The Lawrence Medal is awarded to patients who have been on insulin for 60 years or more. Dr Lawrence was a person with type 1 diabetes and in 1922 he moved to Florence, Italy to live out his final days but in 1923 received the telegram below. " I've got some insulin come back quick it works"
Telegram to RD Lawrence: "I've got some insulin come back quick it works"
Pete also shared his thoughts on how unique type 1 diabetes is, his personal reflections and his personal advice. Pete’s positivity and optimism just bowled me over. Here was I struggling to comprehend 25 years and how long more. And there was Pete after 60 years and shouting “Bring it”. Mike was diagnosed only a few years ago but he was a pilot. This career had previously been off limits for people with type 1 diabetes. Mike shared his diagnosis story and how he got back into the cockpit. Becky is a professional cyclist with Team Novo Nordisk and is also a health care policy consultant. She was diagnosed at age 28 while also 20 weeks pregnant with her first child. Becky was told at her diagnosis by her endocrinologist that she would have to give up her cycling career because of her type 1 diabetes. "I didn’t hear 'no'. I just heard things just might be a bit more difficult. Now, my bike is still my favorite place to be in the world." Not only was Becky’s diabetes story something inspirational but her life before diabetes also. Read more of Becky’s story here. Katie was diagnosed at the age of 22 and was already on her final year of a fashion degree in London. Her intentions to work in the fashion industry and travel the world were clear to Katie’s doctor who advised her to rethink her plan. Thankfully, Katie knew better. Katie’s involvement in an insulin pump group where people who are established on pumps share their experiences with people who are considering pumps made her realise that one of the most use reason for not trying a pump was the “where do I wear it” issue. And this led her to create better options to conceal, carry and access the pump on a daily basis were needed for all. “I've never been embarrassed about my diabetes, or shy about discussing it, but I want to choose who I tell and when rather than it just being on show.” And that's how Hid-In Insulin Pumpwear was created. TADTalk is spearheaded by the Associate National Clinical Director, Diabetes with NHS England, Dr. Partha Kar who said that one of the reasons he is so involved in TadTalk is because he and his fellow clinicians learn so much from the day - the patients become the teachers. Dr Kar is also the co-creator of Type 1 Diabetes comic (“Origins”) while also involved in setting up a Type 1 Diabetes information portal (T1resources.uk). Dr Partha Kar has been a Consultant in Diabetes & Endocrinology at Portsmouth Hospitals NHS Trust since 2008. He is an avid user of social media such as twitter (@parthaskar) to engage with patients – and been recognised as a “Social media Pioneer” by HSJ in 2014. TAD looks like being an annual event but be warned, registration usually books out by lunchtime of opening day. I used my own money to cover all of my expenses to travel to TADTalk because I wanted to go.